The Castle of Spesbourg was built in a dominant position to control the valley of Andlau and the nearby abbeys. It took about four years to complete the construction, between 1246 and 1250. The castle, designed with a large square keep and an inner courtyard, was probably built for Alexander of Stahleck-Dicka, who was a solicitor of the nearby abbey of Andlau. In 1386, the property was transferred to the Lords of Andlau, who became its sole owners. A story from the 15th century suggests that one of the lords tried to seduce a village girl; locals got angry and set fire to the castle. After the Hundred Years War the castle fell into ruins and in the middle of the 16th century it was abandoned. During the last 20 years, the castle has been restored to become more accessible. Fragments of mural frescoes can be seen on one of the vaults in the ruin; they suggest an unusual degree of refinement for the 14th century. 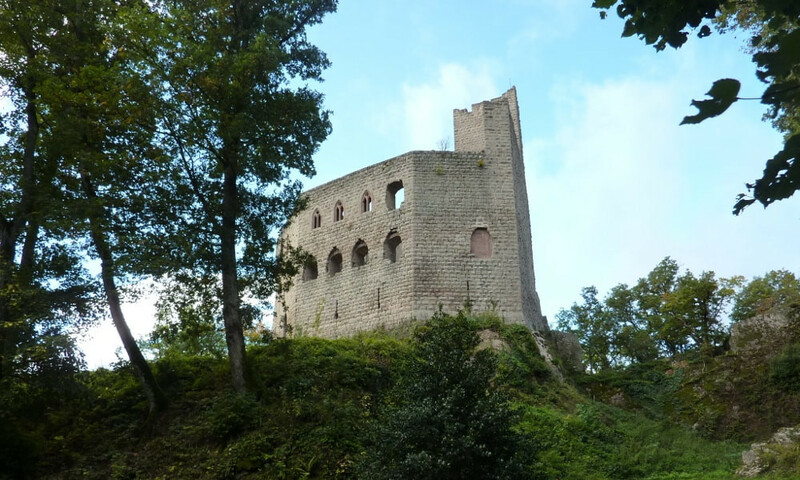 The ruins of the Castle of Haut-Andlau are nearby.